Lindsay talks about what she remembers most from going to summer camp. Warren: So Lindsay, we're both teachers and sometimes our students go off to camp over the summer break. Did you ever go to camp when you were younger? Lindsay: I did go to camp. The camp I went to was called Pilgrim Pines. Warren: What was that like? Lindsay: It was great. It was one week away from my family and each person got to take care of an animal. Some people took care of horses, some people took care of sheep but I got the lucky task of taking care of Xanadoo the llama. Lindsay: Oh, it was awesome. When I was a kid, my favorite animal was a llama so that's why we looked into this camp to begin with and I had to brush it and I had to feed the llama. And it was such a sweet llama that I really fell in love with it and every day I'd wake up and feed the llama and brush it and then in the afternoon I would also come in and visit the llama, Xanadoo was his name. But a couple of times he got mad, I can't remember why actually he was upset but when llamas are mad do you know what they do? Lindsay: Yeah and you have to be, and then if they spit at you that means they're really upset and they can be dangerous. 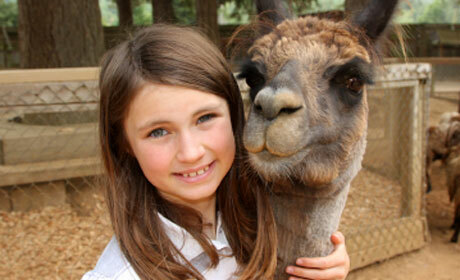 I was only ten at the time so the llama was a lot bigger than me and one time it spit at me and the spit got stuck in my hair and it was this really thick gross mucousy spit and that really struck an image in my mind. I can't ever kind of forget that llama spitting at me. Then after I think, for a day, I was afraid of the llama and then my counselor, my camp counselor, who was in charge of all the children, had a talk with me and told me how sometimes llamas get mad just like people get mad and I need to forgive the llama and I did. Then the next day I went and fed the llama and brushed the llama and everything was back to normal but it was a really good experience to learn how to take care of a pet and a good experience to be away from my family for the first time. Warren: So I guess there were other kids at the camp too? Did you guys all eat together? Lindsay: Yeah, we had a mess hall they called it which is basically a cafeteria. The food was disgusting. I remember losing a lot of weight when I came home and my mom would send me packages of chocolate and cookies and I would eat it all. But yes we all ate together in this gross cafeteria, slop food, like Sloppy Joe for lunch or just imagine turkey and gravy for dinner, but the turkey was kind of a blue color. Everything was just a little bit gross but at one time we had a food fight and that was absolutely amazing. This one kid got upset, the other kids threw some mashed potatoes and the next thing you know turkey is flying, mashed potato is flying and everyone is getting involved and that was really fun, the food fight. Sometimes our students go off to camp over the summer break. I go off to school in the fall. H went off to Germany on business. Spitting is not polite in my culture. In Singapore, it's illegal to spit in public. That really struck an image in my mind. The mention of Brazil struck an image of beaches and samba dancers in my mind. The accident struck a horrible image I will never forget. Then the next day I went and fed the llama and brushed the llama and everything was back to normal. The city was back to normal following the earthquake. It will take decades for the area to return to normal. Someone threw a rock and the next thing you know, everyone was fighting. The game was really boring and the next thing you know, they scored two goals in two minutes! He warned the children that the monkey might at them. That rocking chair did of my grandmother. One car honked and the you know, everybody was honking! The traffic went after the roads had been cleared. We for family vacation every year.